What is a Dharma Hacker? A Dharma Hacker takes a balanced approach. Eastern philosophical aesthetics combine with modern technological influences. See it as the yin and yang of modern existence, the combination of right and left brain, the intersection of technology and the humanities, etc. Dharma has many different meanings. The one associated with Buddhism is the one being considered here. Particularly how it represents a pathway to various teachings, truths and natural laws. It’s a kind of pathway to enlightenment. It also involves practice of the mind, ultimately to harness it and not be subject to its whims. Hacking as it is being referred to here (not the dark side), has its roots in software programming. It often takes a quick fix approach through simple coding workarounds or solutions. These often end up enduring. Nowadays startups apply it to growth and even culture, innovation, life and productivity are open to hacking. Hacking is a very experimental approach. You learn by doing and observing outcomes, progressing quickly with what works, discarding what doesn’t. This is very much in tune with Buddhist philosophy. In the context of InnerVentures and seen through the lens of a Dharma Hacker, the focus is at a personal level, as opposed to an organisational level. 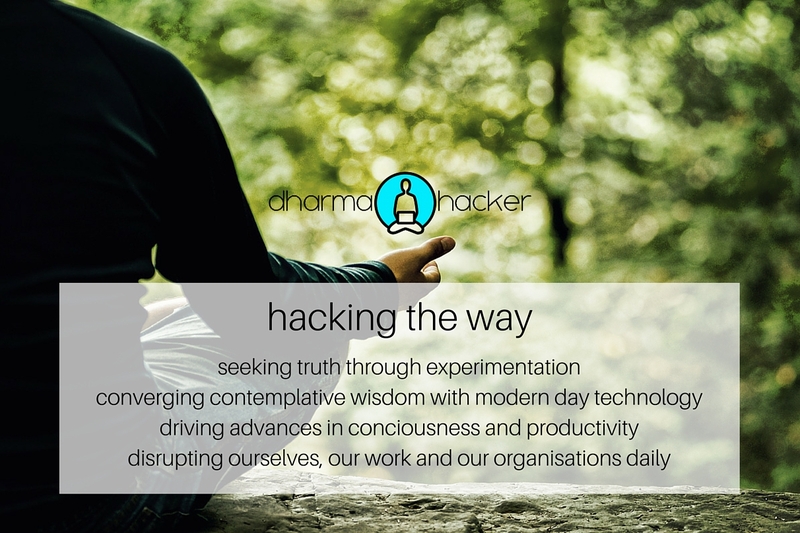 In an increasingly busy, information abundant, faster paced and complex world, the Dharma Hacker foremost but not only looks inward for solutions and progress. Mindfulness practice through meditation is one of the key tools at our disposal. Yet it is not just inward we must look as we are not islands. We have friends and also colleagues at work where we spend much of our time. We must look to what impact our inner journey has on our friends and colleagues and on the world we try to create. Organisations where a lot of this plays out and which have become so vast and influential in the world must also be looked at in terms of what impact we can make on the way they are run. And increasingly we should look at what role technology can play as we contemplate the progress on our journey, positive and negative. There is seeming incongruity between technology that creates much of the distraction the modern world is subject to but a deep interdependence too. We create the technology that creates much of the ills but by the same token, as the creators we can master it too and have it drive positive outcomes. Technology is not going away and must also play its part in our progress if we learn to master it. Technodelics and the use of technology like VR (Virtual Reality) and Apps can help with meditation for instance and are being put to work already. Bots and AI (Artificial Intelligence) can help guide us through tracking and understanding our emotional states and how our thoughts and ultimately reality are defined by this, since our thoughts create our reality. Posts in the Dharma Hacker category and in the page created to capture all these posts will cover this evolving landscape.